Revenue in the Luxury Cars market segment amounts to US$6,566m in 2019. From an international perspective it is shown that most revenue is generated in United States (US$6,566m in 2019). The Luxury Cars Market segment includes passenger cars of an average footprint around 5m2 (54 ft2), an average mass around 2200kg (4850lbs) and a passenger/cargo volume larger than 3.4 m3 (120 ft3). Models of this market are also characterized by their high price. There are numerous companies that produce exclusively for this market. The Luxury Cars Market existed as long the automotive industry, with manufacturers offering their premium models to the upper economic class. Initially dominated by European and American companies, the market structure changed significantly in the 1990’s when the Japanese manufactures Honda, Toyota and Nissan launched their luxury brands Acura, Lexus and Infinity, respectively. Example Models: Audi A8, BMW 7 Series, Jaguar XJ, Mercedes-Benz S-Class, Porsche Panamera. 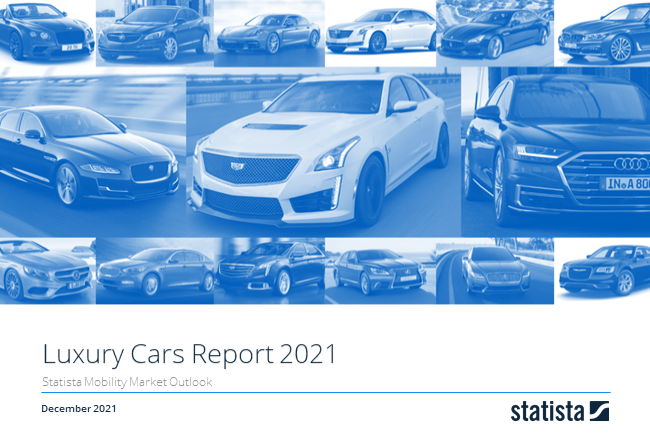 Reading Support Revenue in the Luxury Cars market segment amounts to US$6,566m in 2019. Reading Support In the market for Luxury Cars, volume is expected to amount to 121.9 t cars by 2022. Reading Support The average price per unit in the market for Luxury Cars amounts to US$49,578 in 2019. Reading Support With a market volume of US$6,566m in 2019, most revenue is generated in United States. Here you can find more studies and statistics about "Luxury Cars".